Read and discover a few new comments about our residential park, Some owners, residents, but also curious and interested people were quickly seduced by the new concepts en proposals, If, spontaneously, there’s the desire to leave a few words, do so, for the greaest pleasure to us all. We spent a few weeks with our Cessna 172 in Verchocq to test the new Aérodelahaye track: the change is startling! The practice of the track usually had never been a problem. Indeed, the landing was always very simple, and we adapted our take-off according to the wind conditions. Unfortunately, just after heavy rains, the track was impassable for us: our C172 is an old model, quite heavy and weakly motorized (the engine only develops 145cv, compared with the 160 or 180cv of the most popular models) leaving insufficient margin of safety during a “sticky” take-off. On our last trip, it had rained abundantly the last days and we were very pleasantly surprised by the new track. In addition to better visibility when arriving, the take-off, which would have been impossible on the old track, could be done very easily. The acceleration was good, smooth, and we lifted the wheels to the air stick. In addition, unlike the usual grass tracks, the aircraft does not become dirty during take-offs and landing. Beautiful evolution of the aerodrome of Verchocq! Dear ULM and airline pilots, hello. – We have been enjoying our “air villa” in Airpark Aéro-Delahaye in Verchocq for almost 2 1/2 years. We feel very well and appreciate the very friendly international atmosphere of our Park Residentiel de Loisirs. We are happy to be there. – In spite of this windy and rainy autumn (like most falls, for example), our slightly sloping slope (540 to 590 ft) facilitating the rapid evacuation of rainwater allows us that the weather is favorable, to take the air. To further improve this point, we appreciate Jean-Louis Delahaye’s decision to reinforce its structure in the near future (“Perfo” for example), allowing aircraft to land in wet conditions. So we’re very happy to be there. So we are very – very happy to be there. Do not hesitate any more pilots, come join us, we are waiting for you in Verchocq. “When a dream finds the possibility to be realized, then it is the road all traced to happiness. This happiness we found at the Aero-Delahaye, this Park-air villa in Verchocq, which brings together fans of ULM, airplanes and autogires. Pilots, men and women of all nationalities, sharing the same passion with this constant desire to exchange their adventures and misadventures, always with a lot of simplicity and sympathy. It is a true “thunderbolt” experienced on a rainy afternoon on our arrival (by car) at the Aéro-Parc! A little paradise laid, there, in the heart of a green, a fabulous concept offering the possibility of reconciling family life and passion. We dreamed of a wooden house with renewable energies on a small lot in the middle of the countryside, but we dared not imagine having the beauty of the 7 valleys at our doorstep and the possibility of flying and landing at home! The decision to participate in this adventure was very quickly taken (in a week), the visit of the site by our architect only reinforced our opinion and allow the signature. Air Parc Verchocq is a rising star . We are proud to become part of it. Staying on an air field/strip, with people who share the same passion … this must be heaven on earth for a pilot. Always someone on site, with more than 15 ULM strips within a radius of 70 km, it is happening in France known for its ULM and fly friendly atmosphere. Can this be a dream that comes true ? 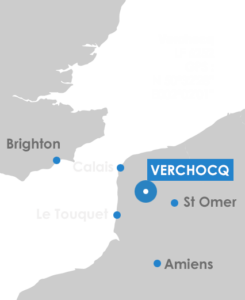 And Verchocq has even more advantages: n ot far from home (2h15 to Brussels), a beautiful scenery for hiking and cycling, pure nature nearby a protected area, only 35 km driving to the coast. Even more important is to find a place where you feel at home, where you can invitefamily and friends, where you can enjoy together. The Air Parc is up and running, but still welcoming new residents. We experience the hospitality of neighbors who are constructing their houses. That makes you feel connected with the Belgians (we will be the 3 rd Belgian family), with the French and everyone else.